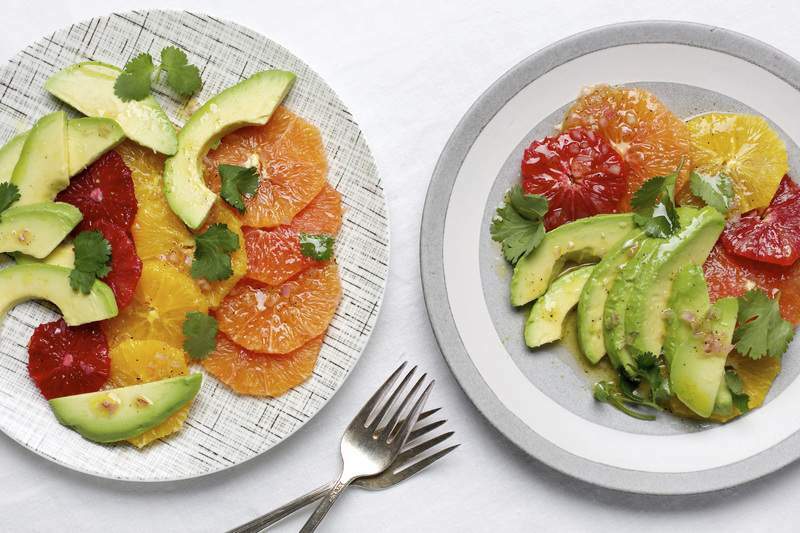 Photo by Deb Lindsey for The Washington Post Citrus Salad With Avocado is a great way to enjoy bright flavors in winter. If you can't escape to a place with warmer weather this winter, at least you can bring some sunny brightness and tropical flavor to your plate with this lovely salad. It revolves around the exciting variety of oranges available in citrus season, each with its own flavor profile. Sweet, orange navels, puckery, reddish bloods and sweet-tart, pink cara caras are few that typically available now at the supermarket – any combination will work here. The oranges are stripped of peel and pith, then cut into rounds which, when plated, form a brilliant stained-glass-like layer. The fruit is topped with pale green, buttery slices of avocado, then drizzled with a simple, shallot-spiked lemon and olive oil dressing, and finished with a fresh, fragrant sprinkle of cilantro. It's a salad that brings a welcome contrast to the deep flavors of whatever you might be roasting or simmering during the winter months, and, if you pause for a moment before you dig into it, you might just feel the warmth of the sun coming through. Whisk together the oil, lemon juice, shallot, honey, salt and pepper in a liquid measuring cup to form an emulsified dressing. Slice off the top and bottom of an orange, standing it on one cut end. Make a series of downward cuts as you work around the fruit, to remove the peel and all white pith. Repeat with the remaining oranges, then slice them crosswise into thin rounds. Discard any pits. Arrange the orange slices on individual plates. Fan out or arrange the avocado on top. Drizzle each portion with the dressing and scatter cilantro leaves over the salads, and serve. Makes 4 servings.